More efficient and more effective – What’s not to love about the BH55-RR drum heater? When put to the test against a traditional 4 inch silicone band heater, the 55 gallon drum was delighted with the Powerblanket drum heater – and you will be too! 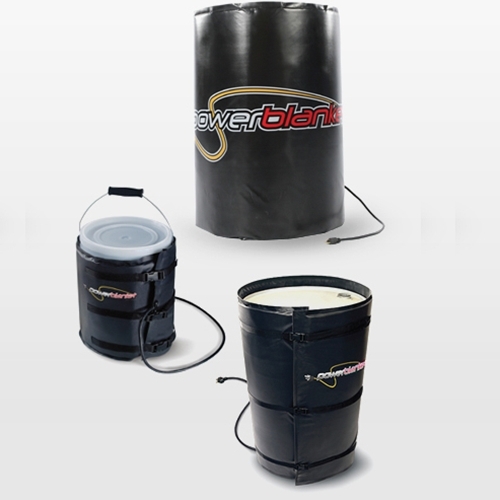 With Powerblanket, contractors are finding that better power usage, more evenly distributed heat and faster ramp up times are making the decision easy – For materials in a 55 gallon drum, a Powerblanket drum heater is the way to go. With new Powerblanket Smart Technology, heat is distributed evenly where needed through a triple heat zone system. As the drum empties from usage or is refilled, the heat zones enact to distribute heat – Getting your materials up to recommended temperatures faster, and avoiding any hot spots or cold spots from damaging the material or impeding on your job progress. Couple that with the efficient design – and your jobsites will go off without a hitch. The BH55 RR features Rapid Ramp technology, allowing materials to heat faster up to the peak 100 degrees Fahrenheit. Internal preset temperature controls and the full insulated design ensure materials get and keep the heat – Over 100 hours longer than a traditional band heater. Use the BH 55 RR Drum heater on either a steel or poly 55 gallon drum. Browse the full equipment line up for bucket heaters, thaw and industrial heat blankets, gas cylinder heaters and more – and enjoy the benefits of Powerblanket GreenHeat patented technology and a simple yet innovative design – Better results, less guesswork – and at the end of the day, a better finished job for you and your clients. For custom orders, hazardous applications, or general inquiries – Contact the pros here at Intech Equipment and Supply for help every step of the way.